Unlock the secrets and health benefits of this ancient internal Chinese martial art! T'ai Chi Ch'uan (or taijiquan), a Chinese internal martial art, is best appreciated in the West for its health and fitness benefits, as an art of self-defense, and as a spiritual path. In classical Tai Chi, these aspects form an inseparable unity. In this guide to the classical Yang style, Petra and Toyo Kobayashi present the foundations of T'ai Chi Ch'uan and give comprehensive insights into its methods. Special emphasis is placed on understanding the inner energy—Ch'i—and its contribution to a refined practice of T'ai Chi and its application in self-defense. 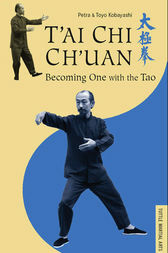 This Tai Chi book contains a clear and fully illustrated exploration of the 37 positions of the Yang style's short form and a basic partner exercise, Push Hands. Easy-to-follow photographs and diagrams with step-by-step instructions will help you to improve your practice. Ideal for practitioners at any level. Important Questions to Ask Yourself and more!